Ms. Chalisa “Mew” Vantayavart, MUIC Alumna 558, Class of 2015, received the BSC Beauty Icon Award in the Miss Tourism Queen Thailand 2017 held recently. 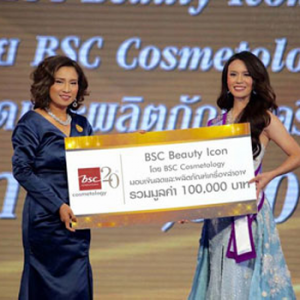 The award came with a 100,000 Baht cash prize and products from BSC Cosmetology. As part of the competition, Ms. Chalisa’s review of the BSC products received the most likes and shares on social media. Congratulations for winning this award!